Gabrielle O'Meara stands next to her home on Hood Circle in Oakhurst. Photo by Cathi Harris. Gabrielle O’Meara has owned her small two-bedroom bungalow at 143 Hood Circle in Oakhurst for more than 20 years. When she bought the house in 1998, she knew the driveway was subject to an easement used by the county to maintain sewer lines. The lines run underneath undeveloped green space between the backyards of the houses along Hood Circle and those to the west facing East Lake Drive. 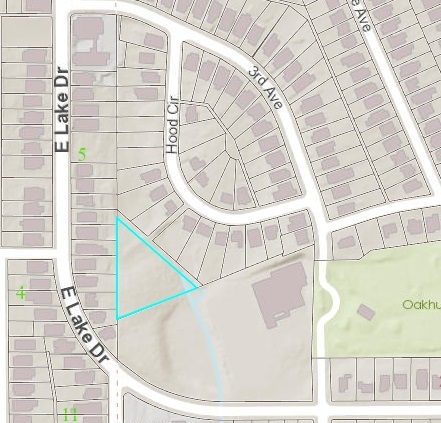 According to the city, O’Meara’s driveway is actually an alley serving as access to multiple properties along Hood Circle and East Lake Drive, including a landlocked parcel next to the Oakhurst Dog Park that was recently sold to a real estate developer. That parcel, listed in county property records as 446 East Lake Drive though it has no street frontage, is adjacent to land the city leases from the Samuel L. Jones Boys and Girls Club for use as the Oakhurst Dog Park. In 2014, a developer who wanted to purchase part of the dog park property also sought to buy the land, but the previous owner declined to sell. In the past, different neighbors and groups of neighbors have tried to buy the plot as well, O’Meara says, but their offers were likewise rejected. A parcel map showing 446 East Lake Drive (the parcel is outlined by the blue triangle). Aside from somewhat frequent sewer repairs, both homeowners say there have been no issues with the property. The wooded property was home to rabbits, eagles and lots of other wildlife that they enjoyed watching from their back windows. But things changed late last year, when the owner of the property put it up for sale. In November, Durel says she and her neighbors noticed surveyors out measuring boundaries on the land. A real estate agent claiming to be under contract to purchase the property visited O’Meara’s house and said he “needed to build me a new driveway” because he would be using it to access the property, she says. At a December meeting with several neighbors, the agent, Nick Whitson with eXP Realty in Atlanta, said he was representing a group of investors who wanted to build a large 4,000 square-foot home and garage. The placement of the home would put it close to the back fence of many of the neighbors, and the height would mean it would loom over the back of their houses. According to city and county records, the property is zoned R-60, Single Family Residential, which means it can be developed with one, single-family residence, provided that the construction complies with all current city codes, including stream buffer requirements, tree conservation, on-site stormwater retention, lot coverage limits, and setback requirements. In an email to Decaturish, Whitson confirmed that he had been part of a group that was in negotiations to purchase the property, but later decided to withdraw. DeKalb County property records indicate the land was sold to a Rickenbacker Way Partners, LLC, for $90,000 on December 18, 2018, just days after Whitson’s meeting with the neighborhood. Attempts to contact a representative of Rickenbacker Way Partners, including through attorneys representing them, have been unsuccessful. O’Meara says a man identifying himself only as “George” and declining to give a last name came to her house in January and asked about a patch of gravel the county installed behind O’Meara’s driveway. The man told her that the planned house would be around 5,000 square feet and three stories tall, she says. This prompted O’Meara to retain an attorney to clarify the exact legal status of the property she has used as her driveway. Like other neighborhoods and towns developed during the early 20th century, many older subdivisions in Oakhurst were designed with alleys — private drives that served as access to rear (off street) end of residential lots. Alleys were meant to serve several functions, including allowing cities to collect garbage placed along the alleys — instead of the public street — and to allow the homeowners to keep shops and other workspaces out of sight. Over time, as modern zoning and land use regulations separated commercial and residential property uses into different districts, and as more people owned cars, alleys became less common. In Decatur, alleys are not public streets, but are jointly owned by the adjacent property owners. A document provided to Decaturish by Decatur Planning Director Angela Threadgill explained the legal status of most alleys in Decatur. Individual property owners cannot close off or deny access to the alley from other adjoining property owners. Alleys can be abandoned and closed off only if all adjacent property owners consent and legally sell or quitclaim away their interest in the alley and access. There are private alleys all over Decatur. Some are old and some are new. Some are paved and well maintained by their joint owners, while some are not marked, overgrown and unused, and are barely noticeable. As properties have changed hands over time, some homeowners may not even be aware they are there. 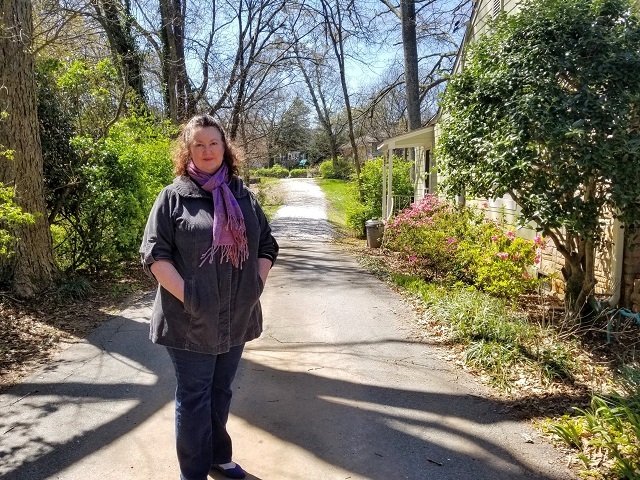 Communications between city officials and the neighbors indicate the city’s records consider O’Meara’s driveway part of an 10-foot alley that is jointly owned by O’Meara, the home next door at 149 Hood Circle, and the lot at 446 East Lake Drive. According to the real estate attorney retained by O’Meara, the deed records maintained by DeKalb County indicate that the previous owners of the properties adjoining the alley sold their portions of the alley to a previous owner of O’Meara’s property in the 1940s. The tract of property that is now 446 East Lake Drive used to be part of another lot that had access to both the alley and frontage on East Lake Drive. But, the portion of that land that was divided off to form the disputed tract does not adjoin the alley and, therefore, cannot claim ownership or use of it. The path was left open to maintain the county’s access to the area for sewer line work, as she originally thought, she says. She directed her attorney to write a letter to that effect and send it to both the City of Decatur and the attorneys representing Rickenbacker Way Partners. Attorneys for the owners have also filed an opinion letter with the city indicating they disagree, O’Meara said. 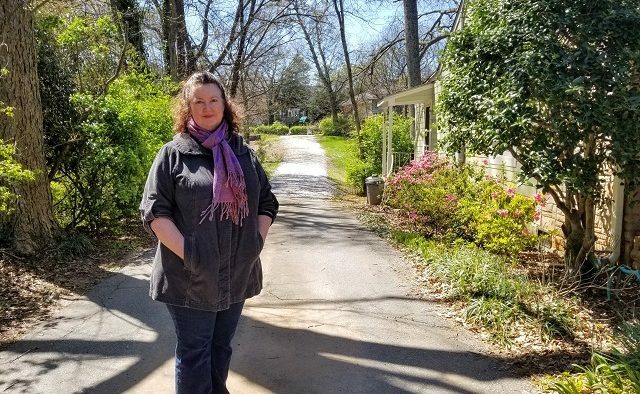 At the February meeting of the Oakhurst Neighborhood Association, Mayor Patti Garrett told concerned residents that the city has told developers that the city will not issue a building permit until they have a legal opinion showing the new owners have clear legal access to the property. In the meantime, O’Meara has hired a firm to conduct a new survey of her property and the adjoining properties to help settle the issue, but, ultimately, she fears, it may be up to a court to decide.